During the years Sindy had several friends and relatives, starting with boyfriend Paul in 1965 and sister Patch in 1966. They both have their own page on this site. In 1968 there were Vicky, a friend and Mitzi, a friend from France, both the same size as Sindy. Also in 1968 Sindy's little cousin Betsy from the USA was introduced and Poppet, a friend for Patch. June came in 1972 and later in 2 more versions. Then Sindy had to do without friends until 1986 when both Mark and Marie appeared for one year only. On this page we will show some off these dolls, Vicky and Mitzi and Poppet may arrive later. Betsy is a very small doll, 6 inches or 15cms tall. She has the same body as the better known Tutti from Mattel, with wires in arms and legs. Her body is marked Made in Hong Kong. She has a round little head marked Hong Kong with blue eyes without lashes and orangey lips. She has curly hair with bangs and came as a blond or a brunette. This doll is very rare as she was made for 1 year only. Betsy has only 4 outfits. June was never sold in the shops but was available ( in the UK only) for 24 Sindy heart tokens, which could be found on boxes of Sindy clothes and dolls. In the 1972 booklet this fact was published and first June was pictured. Two more June dolls would follow after this one but their pictures were never published in the catalogues. The first June was Patch sized, 9 inches or 23cms tall. She has a Patch body marked 047001 and her head is marked 055001. She has curly, reddish hair , a big pink mouth and pink cheeks and a stubby nose. This doll is rare. The second June was Sindy sized with a Trendy girl body with Trendy Girl markings and a much sweeter face. Her head was marked 0550 4 on the head. She has big, pretty red lips and platinum blond hair with a fringe. The third June had the 1975 skinny Sindy body and again another face. Her head has the same markings as second June, her body is marked MADE IN HONG KONG 033126 x and 033127x. June has pink lips and big blue eyes and can be found with honey blond or platinum blond hair. This doll is the easiest to find of the June dolls. Sometimes this head is found on a Trendy girl body, I'm not sure if this is factory-made or not. Marie has lovely shiny red hair with matching eyebrows and lilac eyes. She has an open, smiling mouth and is marked: Marie on her head. 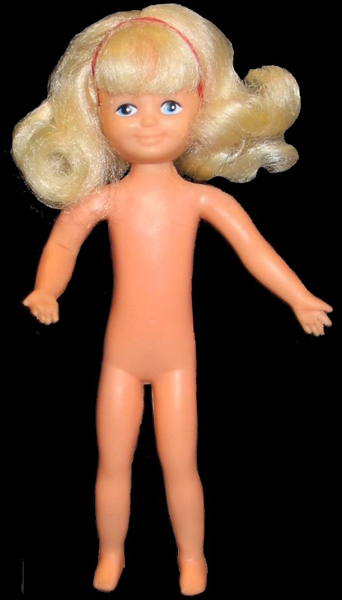 She has the standard Sindy body but unmarked and with rather big hands. Her arms are soft but do not bend, her knees do. She was sold separately or as a bride in the Royal Wedding set. Mark arrived in 1986. He has brown moulded hair and green/blue eyes. His arms do not bend but are fixed in a half bend position. His legs do bend at the knee. He has a shapely body and is marked Pedigree Toys & dolls LTD on his lower back. He came separately or with Marie in the Royal wedding set. My Sindy, sindy doll, Fashion doll outfits, vintage, doll, centre part, centrepart, sidepart, side part, funtime, mamselle, Mam'selle, trendy girl, top pop, lovely lively, poppet, martinair, and klm dolls to follow soon.